The Wellington Cathedral of St Paul stands close to the centre of New Zealand’s seat of government. Parliament and its grounds are across the road from the Cathedral’s main entrance; the National Library of New Zealand stands on a corner opposite, with the Appeal and High Courts of New Zealand close by. ‘Every nation needs in its capital city a great church to express its belief in the things of the spirit’, said Archbishop Reginald Owen, the Bishop of Wellington and sixth Archbishop of New Zealand. He was speaking at a rain-soaked ceremony in 1958 to a congregation sheltering under umbrellas among the scaffolding of the Wellington Cathedral, hardly begun and still lacking, for the most part, a roof. With Parliament and Judiciary so close, the Cathedral of St Paul is ideally placed to fulfil the role that Archbishop Owen envisaged as a spiritual centre in New Zealand’s capital city. The service in the partly-built Cathedral commemorated 100 years of the Diocese of Wellington; however the dream of an Anglican Cathedral for Wellington dates from before the start of the Wellington Diocese in 1858 and before the city became New Zealand’s capital in 1864. The 1840s: As early as the 1840s a start had been made on the bricks with which it was hoped to eventually build a cathedral. That project came to an end in 1855 after a major earthquake hit Wellington which highlighted the unsuitability of brick buildings in such an area. The first St Paul’s Church in Thorndon had been built from wood and established by the early settlers at the back of Parliament, behind which the Beehive now stands. A second timber-built St Paul’s (still standing nearby in Mulgrave Street and affectionately known as Old St Paul’s) replaced the earlier church. However this second church was only ever seen as a pro-Cathedral – namely, a beautiful building that would serve until a Cathedral proper could be built. Beautiful though Old St Paul’s is, and extended as it was to cope with a growing population, the Wellington Diocese continued to look to the completion of a full, working Cathedral. Consecrated in 1866, Old St Paul’s would, however, house the Bishop’s chair for 98 years. A site for a Cathedral: During this time several steps were taken to try to ensure Wellington would have an Anglican Cathedral to match the city’s status. In 1895 a trust was formed and land purchased in Taranaki Street, to the south of the city centre. In 1907 it was decided that this site was no longer suitable and plans were made to build a Cathedral adjacent to Government House, close the Basin Reserve sports ground, and today the site of St Mark’s Church. After World War One, enthusiasm for the building of a Cathedral waned as hard economic times and a major depression battered the New Zealand economy. Plans were revived in 1937 when it was decided to make the Cathedral a project for the national centennial of 1940. World War II intervened but in an act of faith in 1943, with the country still at war, the first piece of land was acquired at yet another site, this time adjacent to Parliament, in Molesworth Street, where the present Cathedral now stands. The site for the Cathedral cost the Church 136,354 pounds. However, in the delay created by World War II, the cost of building the Cathedral had risen steeply. The sum of 250,000 pounds, which had been raised to build the Cathedral before the war, would now only build about half of it. As well as the site, the architectural design had also changed. The Cathedral, as originally planned had taken its inspiration from the great medieval Cathedrals of Europe, only built in ferro concrete instead of stone. The Napier earthquake in 1931 suggested the wisdom of another change of plans and material. The present Cathedral of St Paul was designed on less ornate lines and built of the stronger reinforced concrete. Cecil Wood, appointed by the Wellington Diocese as the architect of the new Cathedral in 1938, designed the building. Though he died in 1947, and never lived to see the Cathedral so much as begun, the building today is still very much as he envisaged it. In the pre-war years, Cecil Wood had travelled and worked overseas and his design for the Wellington Cathedral was influenced by what he saw and the buildings he studied. These included Stockholm Town Hall, the Art Deco architecture of Southern California, and the neo-Byzantine-style of Westminster Roman Catholic Cathedral, London. Designed by John Francis Bentley and built in 1895-1910, its large plain unadorned surfaces, great piers and semi-circular arches of the nave find echoes in the design of the Wellington Cathedral. For the Cathedral planners the wheel would turn full circle when some 60 years later New Zealand architect Miles Warren was asked to oversee the final completion stage of the Cathedral. As a 16-year-old he had worked as an articled pupil draughtsman for Cecil Wood. Though the Cathedral was constructed in three separate stages, and various other designs to complete the Cathedral were at different times suggested, this building, with only some modifications, has remained faithful to Wood’s original design. 1954 Foundation stone laid: The Cathedral’s foundation stone was laid by a young Queen Elizabeth II on 13th January 1954 on her first visit to New Zealand and blessed by Archbishop Owen. Construction began the following year. However, it was 10th May 1964 before the doors of Old St Paul’s were formally closed. 1964 Opening and Dedication of first stage of the Cathedral: Then, on 14th May, bearing chalice and paten, walking behind the Cross held on high, the officers of Old St Paul’s entered and took possession of the new, though still only partly-built, Cathedral. The march from the old to the new was led by Henry Baines, seventh Bishop of Wellington, and the then Dean of Wellington, Walter Hurst. The Cathedral of St Paul was dedicated by Bishop Baines on Whitsunday (Pentecost) 17th May, before a congregation of 600 which included the Governor-General Sir Bernard Fergusson and Prime Minister Keith Holyoake. The Cathedral was now a place of worship, and central to it were the 1.5 metre high sterling silver altar cross and the two candlesticks. Designed in London, they were bought in England by Archbishop Owen and donated to the Cathedral by the Mothers’ Union. 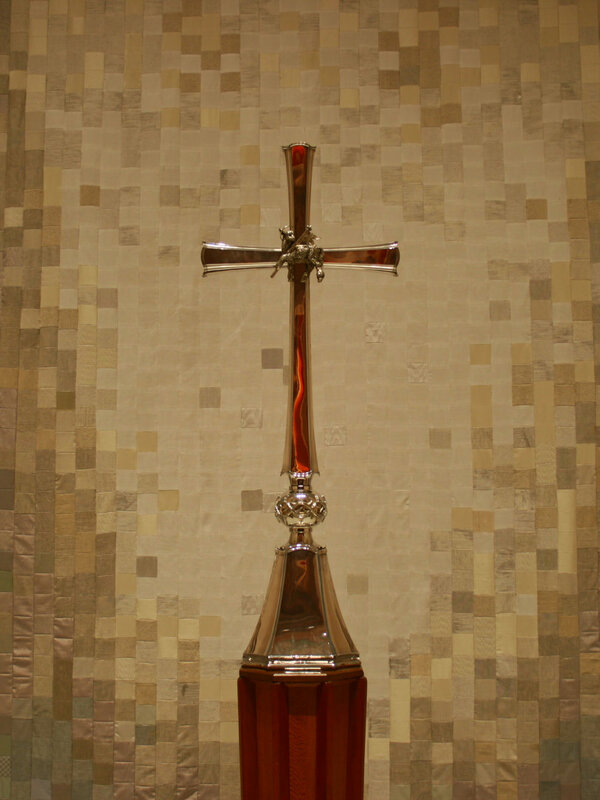 Though the Cross and candlesticks arrived in Wellington in 1960, it was 1963 before they were removed from safe storage. They were first put on display in Kirkcaldie and Stains, a leading Wellington store, before being placed in the Cathedral. The floor in the sanctuary, where the Cross and the candlesticks stand on the altar, is white marble, a setting designed to reflect the biblical quotation: “And before the throne there was a sea of glass like unto crystal…” (Revelation 4:6). As in Cathedrals down the ages, the work of many craftsmen and women has gone into the making of this Cathedral. The ten sedilia, or seats for clergy and assisting ministers, beside the altar in the sanctuary are of moulded concrete. The seat backs, carved by a team of expert joiners here in Wellington, are made from Japanese oak. Each seat back has 28 pieces of wood and most of the design is hand-carved. The figures above the seats represent St Peter and St Paul, the saints of God, Christian symbols and, reflecting the Cathedral’s New Zealand heritage, two New Zealand birds, the tui and the fantail, and from the forest, the kowhai tree and tree fern. Tapestry Kneelers: At least six million stitches went into the hand-made tapestry kneelers for the new Cathedral. The oldest embroiderer was 85; the youngest seven. Each kneeler carries the name of the congregation or organisation that made it. From the Missions to Seamen came a kneeler stitched at sea by sailors; another kneeler, bearing the initials L F, is the work of Lady Fergusson, whose husband was then the Governor-General. Kneelers were gifted by churches in the Wellington Diocese and by congregations in churches as far away as Britain. The first stage of the new Cathedral, finished in 1964, was considerably shorter than its present exterior length of 88 metres. The sanctuary and chancel were complete, the “star” ceiling where the chancel meets the nave was in place, 18 metres above. However the 24 metre wide nave stopped short at the first bay. 1970 The 2nd stage of the Cathedral: In 1969 the Diocesan Synod approved the plans and in February 1970 the next stage towards the completion of the Cathedral began. This involved extending the nave by 17.6 metres to add another two and a half bays to the original one. This stage also included the construction of a 3.3 metre wooden screen round the chancel at the back of the choir stalls. At the Parliamentary end of the Cathedral, at the rear of the nave, a temporary narthex (foyer) and entrance porch were built, along with a gallery over the narthex, extending into the nave. The outside wall overlooking Parliament was also temporary and without a window. In 1970, the Holm window, over the three doors leading to the Cathedral’s Loaves & Fishes Hall, was installed. Designed by Beverley Shore Bennett, a leading New Zealand stained glass artist, and made by Roy Miller of Dunedin, the window is a memorial to Ferdinand Holm, founder of the Holm Shipping Company, and his wife Mary. St Paul, the patron saint of the Cathedral, is shown in the centre at the top of the window; the stars of the Southern Cross and the Holm Company flag are at the top, left. The three ships represent stages in the development of the Company. Beverley Shore Bennett also designed the stained glass in the windows of the Cathedral ambulatory (the passage in behind the high altar). These are based around the “I am” statements of Jesus – the Bread, the Way, the Vine, the Life, the Resurrection, the Lamb of God. The windows contain many symbols, which elaborate on these themes, for example the life cycle of the Monarch butterfly can be seen in the Resurrection window. Stained-glass windows in the chancel, above the choir stalls, commemorating the Army, Navy and Merchant Navy, were designed by New Zealander Howard Malitte and adapted and cartooned for stained glass by Brian Thomas, London. Brian Thomas also designed stained glass windows in London’s St Paul’s Cathedral and Westminster Abbey after World War II. Another English artist, E Liddall Armitage, designed the Air Force windows on the pulpit side. Members of the Service gave the windows. The Church in action and instruments of worship. The Hutton Angels: Angels engraved on panes of glass at the entrance to the Cathedral are the work of New Zealand-born artist John Hutton. When the Cathedral was completed in the 1990s, the panes were removed from the temporary narthex and stored. Reinstated in the completed Cathedral, the panes remain the focal point of the glass screen between the narthex and the Cathedral nave. Similar Hutton windows are a highlight of Coventry Cathedral, England, where they link the new Cathedral with the old one which was bombed during World War II. Another link, a Cross of silvered nails, made from thousands that fell from the burning roof of the old Coventry Cathedral, is on the Canon’s stall at the left of the chancel steps. 1972 The 2nd stage completed: The second stage of the building of the Cathedral of St Paul was completed in 1972. That year, on November 5, the Governor-General Sir Denis Blundell and Lady Blundell were part of an 800-strong congregation at the Re-entry and Dedication of the extended Cathedral by Bishop Henry Baines. However the building was still incomplete. The nave was truncated and the Cathedral was, on special occasions like Easter and Christmas, too small to hold those wanting to take part in services. Work towards the completion of the Cathedral went on elsewhere in the building. 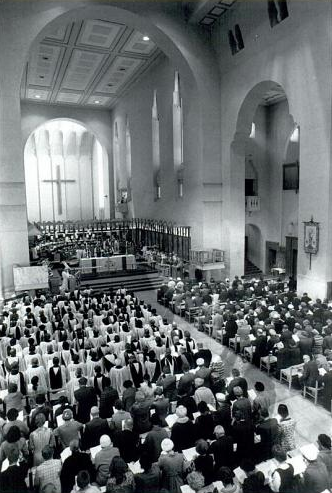 Interior with choir in crescent arrangement at Bishop Norman's consecration in 1973. Evening Post. 1980: The Organ: In 1980 the Cathedral organ was rebuilt and enlarged. It had been first installed in Old St Paul’s in 1877 as a two-manual tracker action instrument blown by water pressure. When it moved to the Cathedral it had been enlarged to a three-manual organ, but the instrument was showing signs of wear. When it was rebuilt, exciting additions included the fanfare trumpet and the gallery trumpet, both visible from the nave. The master console now has four manuals, 81 stops and there are some 3,500 pipes. 1984: The Bell Tower: In 1984 the building of the bell tower extended the Cathedral yet again. It was dedicated on Easter Day, April 1984. The peal is made up of 14 bells, named after those who donated them. One, the largest, a tenor bell, known as the People’s Bell, was donated by 1273 “Honorary Bellringers”. The bells maintain the Cathedral’s link with Old St Paul’s as two of the bells were brought from the old church. Eight other bells came from the Church of St Edmund, Northampton, England, where the church and tower had been condemned as unsafe and the bells taken down and placed in storage. A bell from Eastbourne, England, hangs above the Commemorative Tower balcony. This was installed in 1998 when the Cathedral was finally completed and is rung, a solitary bell, on special occasions. 1990: The Dossal: The dossal at the back of the high altar – the word dossal is French and refers specifically to an altar hanging – was put up in 1990 and is yet another dramatic work of art created for the Cathedral by Beverley Shore Bennett. The centre panel depicts the overshadowing presence of Christ who promises to be present “wherever two or three gather in my name”. The two side sections contain symbols used for centuries in Church art and decoration. The three panels measure in total approximately 8.8 metres by 4.5 metres. The centre panel alone is made up of 4680 pieces and weighs 20 kilograms. Beverley Shore Bennett both designed and made the dossal, which took her three years to complete. In 1976, for her artistic contribution to the diocese, Bishop Edward Norman, eighth Bishop of Wellington, installed her as a Lay Canon in the Wellington Diocese. She was the first woman in the diocese to be so honoured. 1991: The Lady Chapel: In 1991, Brian Davis, Archbishop of New Zealand, consecrated a Lady Chapel. The historic wooden building, built in 1905, was formerly the Church of St Paul at Paraparaumu. When that parish decided to build a new and larger church, the old one became redundant and was gifted to the Cathedral as a Lady Chapel. Located off the ambulatory to the left of the pulpit, the chapel is built of rimu and matai, highly prized New Zealand timber. The stained-glass windows, designed by Beverley Shore Bennett and made by Stephen Belanger-Taylor, focus on the life of the Blessed Virgin Mary, Our Lady, mother of Jesus. The addition of the small wooden chapel, which was trucked south in sections to its new site alongside the Cathedral, was seen as especially appropriate given that the first St Paul’s, here in Thorndon, had been just such a wooden building. 1992 The Cathedral completion: The decision to complete the Cathedral, and raise the $6 million needed for it, was taken in 1992 by the Diocesan Synod. The temporary narthex, entrance porch and gallery were removed and a screen went up between the completed part of the nave and the extension so that the work of the Cathedral as a place of worship could continue. A further 3 bays were then added to the nave, and a new and permanent narthex, porch and gallery built to replace the old. The temporary end to the building that overlooked Parliament was removed and replaced by the present window, with its 11 metre high Cross. The new plans included a visitors’ centre/Cathedral office, a clergy office, and the Commemorative Tower. The Commemorative Tower foundation stone was unveiled by Queen Elizabeth II on November 5, 1995. A room in the tower now holds the Cathedral’s important collection of flags. 1998 Dedication of the completed Cathedral : Bishop Thomas John Brown, 10th Bishop of Wellington, dedicated the completed Cathedral on May 31, 1998. 2001 Consecration of the Cathedral: On 15 October 2001 the Cathedral was consecrated by Bishop Thomas Brown, 10th Bishop of Wellington. 2002 Unveiling of the Consecration Stone by the Queen: On 24 February 2002 Her Majesty the Queen unveiled the Consecration stone, her visit in October 2001 having been postponed because of security concerns after the September 2001 terrorist attacks. Adapted from the text by Judy Bradwell, Wellington Cathedral of St Paul: The Building of the Cathedral.